Fish, snakes, frogs, aquatic plants, clams, and other turtles. 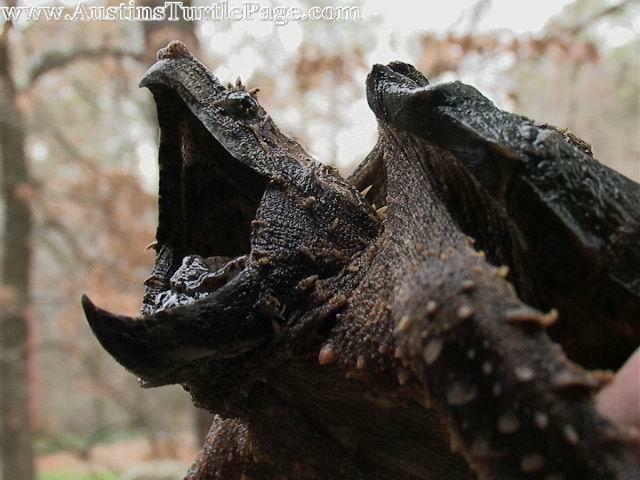 Alligator Snapping Turtles live in the deep water of large rivers, canals, lakes, swamps, and bayous in the states where they occur. Texas, Mississippi, Florida, Louisiana, Arkansas, Georgia, Oklahoma and Missouri. Hatchling a 20-50 gallon tank will last a while (about a year), these turtles as they get older will require large tubs, stock tanks, and ponds. They require lots of underwater obstructions to feel comfortable. Logs, driftwood, smooth rocks, stumps, and other similar features will help the turtle feel secure and “invisible”. Filtration needs to be of the highest caliber, unless you want to do at least weekly 100% water changes. Pond filters will work well with stocks tanks and ponds; however, they need to be secured at the inlet. I recommend an outdoor pond above all else for adults, with 800 gallon stock tanks just behind. Juveniles (6-12 inches) are fine in smaller stock tanks and large (100+ gallon) aquariums. Commercial turtle food, live guppies, small freshwater minnows, crayfish, cooked chicken, chopped bluegill, bass, and other game fish (can be served whole and live for large adults), mice, chicks and rats can also be fed to larger individuals. Remember to also offer some vegetable matter such as water hyacinth, water lettuce, grapes, cherries, bananas, apples, and carrots. Despite many large adults often being kept with other turtle species in zoo exhibits, alligator snapping turtles are best kept alone. Because of their extremely large size (heaviest freshwater turtle in the world), alligator snappers are not for beginners, or even experienced keepers if they cannot provide the space for these beasts.